Read the creation myth about how the sun came to the forest, the flood story that explains how fruit trees came to be and discover why water lilies float on the river. There is also an original story about the famous water spirit called Bufeo Colorado. 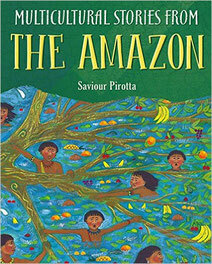 He lives at the bottom of the Amazon river during the fiesta, he comes ashore to lure people to his underwater home.